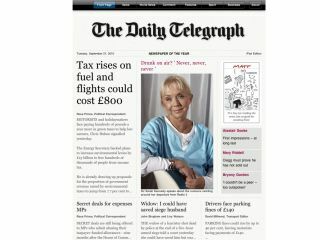 A new Telegraph App for iPad has been launched, with the Telegraph Media Group offering a £1.19 daily edition or £9.99 monthly rolling subscription. The Telegraph App for iPad, which will be free to print subscribers, will give people an 'enriched' offering, inclusing video, picture galleries, interactive crossword puzzles and, crucially, the brilliant Matt cartoon. The edition will be available for download to the app each morning and will be pushed to the app automatically delivered if users want. Edward Roussel, Digital Editor, Telegraph Media Group: "Following extensive research we know that our iPad readers want their Telegraph articles enriched with digital content plus a celebration of what makes the Telegraph distinctive, such as Matt and Alex cartoons, crosswords and our top columnists. "We are delighted to be able to offer the new iPad edition of The Telegraph via the App Store." The app faces stiff competition, not least from its long-term rival The Times which has the added draw of not offering its content free on the internet, at least until The Telegraph goes behind a paywall later in the year.